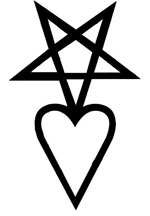 Designed by Ville, this symbol became one of the most popular symbols in the Rock music spheres. 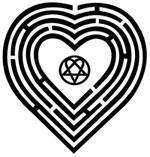 The circle was added with the release of Love Metal. This snake is on eof the covers of the single - The Sacrament. 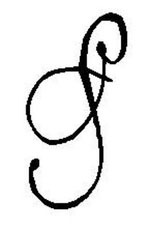 This symbol is also on of the limited versions of the single - The Sacrament. This is from the cover of And Love Said No. This razor was used during Razorblade Romance era. It is in the booklet of the CD, where the text are imprinted. 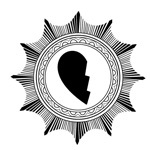 This symbol is used in the set-scene of the winter version Join Me In Death. Due to the ambiguous information in teh web, it is not clear what exactly it stands for but it seems to derive from a cross. This symbol is also from Този Razorblade Romance era. It is used in the video of Join me as well as in its cover. It is concidered to stand for something like a seal. The figure in the middle is of a half-broken heart. This is Egyptian symbol. 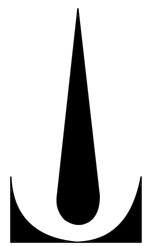 It is present in some limited versions of Deep Shadows And Brilliant Highlights, too.Ville has a tatoo of this symbol on his leg. Ville doesn't have this tatoo anymore. He changed it afterwords. The tatoo is very old and he has made it as a present to his ex-girlfriend Susanna.